On 1 September 1939, Regional broadcasting passed out of existence. It returned on 29 July 1945 — not quite in the same circumstances as before, but with sharpened purpose — to shoulder all its old responsibilities, and to meet the challenge of new needs and new opportunities. The Regional programme of today retains what was best of the pre-war pattern. Music, talks, discussions, drama, documentaries, religious services, outside broadcasts, light entertainment are still there, reflecting the Region’s cultural traditions, serving the Region’s special interests, encouraging the Region’s creative resources, and providing opportunities for its native talent. But, in addition, a whole new field of Regional broadcasting — ground which before the war was largely undeveloped — has been opened up. it was inevitable that this widely renewed interest in the contemporary scene should find a marked reflection in post-war Regional broadcasting. It is hard to realize that up to 1939 there was no broadcast Regional news service in most parts of Britain. Nowadays the Regional news bulletin at 6.15 each evening draws an enormous audience throughout the land, each bulletin in its area serving a purpose and enjoying status and influence comparable to that of the BBC’s national news bulletins in their wider field. The Regional news service is supplemented by news talks, commentaries, and news-magazine programmes, and between them these news broadcasts mirror thoroughly and faithfully the life and activities of each Region. The size of the audiences to these broadcasts is a measure of their impact upon public life. An enlightened community, alert and sensitive to developments around it, will also be articulate. So there is a second new ingredient in post-war Regional broadcasting which is of equal importance. The Regions have news and they also have views. Those views concern Regional problems. They also express distinctive personal and characteristic opinions on national affairs. There is no dreary uniformity of ideas and views throughout these islands. A Scot, a Welshman, a Yorkshireman, a Midlander, an Ulsterman, a Cornishman will each have different opinions on many a proposal conceived within ‘the Whitehall square mile’. During the last three years, the Regional programme services have come into their own as the natural platforms on which Regional opinions can be aired and Regional ideas discussed. ‘WHEN IT’S MY TURN, I’LL TELL THEM SOMETHING’ – People at Westbury take turns to speak their minds. Opinions are forthright and spontaneous, and Gordon McMurtrie keeps the ball rolling. Take West Region as an example. Its series, ‘Speak your Mind’, has visited thirty small towns in the West Country. 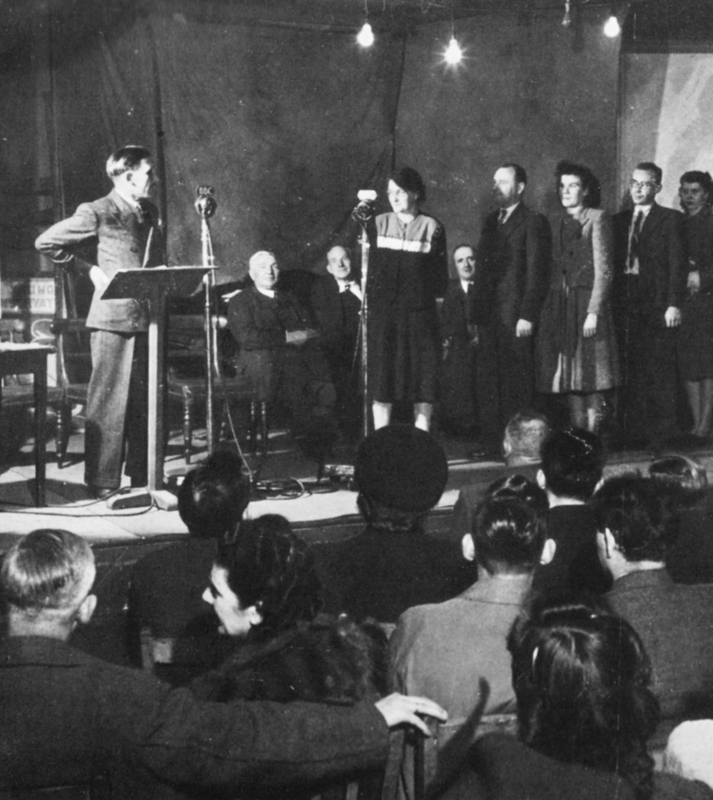 At each broadcast the Chairman, Gordon McMurtrie, has put a number of provocative questions (sent in by listeners) to a representative audience gathered in one of the town’s public buildings. Members of the audience with views to express on those questions have been free to come forward and state them—openly, spontaneously, and without restraint—at the microphone. Some of these questions have had marked local significance. At Bude, in Cornwall, plenty was said on both sides in reply to a question suggesting that hotel owners were over-charging holiday visitors. An Isle of Wight audience broadcast a lively discussion on a proposal to link the Island to the mainland by a tunnel. An audience at Honiton (the home of hand-made lace) had strong views each way about the usefulness nowadays of local crafts. At Painswick, in Gloucestershire, there were some forthright opinions on whether bell-ringers should be allowed to practise on week-nights. The argument of these and many other local issues, on topics weighty and sometimes not so weighty, has made compelling listening. So, too, have the discussions in every ‘Speak your Mind’ session on questions of more general concern. ‘Are country people better fed than townspeople?’ ‘Should natives of a town have priority when Council houses are allocated?’ ‘Why is the Territorial Army recruiting campaign going so slowly?’ ‘Should local Councils hold open meetings periodically, so that rate-payers can comment and criticize?’ And so on. There is never any shortage of pungent questions, and seldom are the members of the audiences at a loss for opinions upon them. But as in ‘Speak your Mind’, so also in ‘Any Questions’ there are questions of wider scope. ‘Is nationality an obstacle to world peace?’ ‘Do the British submit to laws too meekly?’ ‘Is nationalization ruining initiative?’ ‘Where does Socialism end and Communism begin?’ ‘Shall we ever again be able to buy all the meat and fats we want?’ Audiences evidently study the special qualifications of the experts on the platform; the questions raised are very frequently on subjects which can be discussed with considerable authority by members of the panel. In the main, ‘Speak your Mind’ questions are on matters which can be usefully discussed in terms of everyday experience and ordinary common sense. In ‘Any Questions’, the subjects raised are those upon which the ordinary listener feels he needs the help and guidance of expert opinion. Questions on religion are not barred in ‘Speak your Mind’ or in ‘Any Questions’. But they are dealt with specially in a monthly West Regional studio programme called ‘Thinking Aloud’, in which a small team of clergy and laity around a microphone discuss quite freely and spontaneously the questions which listeners have asked on matters of Christian belief and conduct. In all these programmes much that is said is highly controversial. That is only to be expected. Many of the more routine talks and discussion programmes broadcast from the studios of the West Region also deal with controversial issues closely touching the lives of people living in the seven counties of the South-west. This was particularly true of the ‘County Commentary’ series, in which newspaper editors, writers, and people prominent in public life were invited to state their views freely on the air. The BBC takes what steps it can to ensure that a fair and impartial balance is maintained in the presentation of controversial issues at the microphone. This balance is reasonably easy to maintain over scripted broadcasts spoken in the studios. But the spontaneity of ‘Speak your Mind’, ‘Any Questions’, and ‘Thinking Aloud’ naturally raises unusual difficulties. At any moment, and quite unexpectedly, things may be said on the air which cry aloud for some sort of balanced reply, and there may be nobody present able or willing to give such a reply — or the offending statements may come at the very end of a broadcast when there is no time to give the other side of the story. So, as a final safeguard, West Region inaugurated a correspondence-column-of-the-air, a regular programme called ‘Air Space’. ‘Air Space’ stands behind all the controversial broadcasts of the Region. Any listener who considers that justice has not been done in a broadcast, that something has been misrepresented, that the whole truth has not been told, can write to ‘Air Space’ with the knowledge that if his case is a good one his letter will be read at the microphone, and that his statement will receive just as much publicity as the broadcast which provoked it. ‘Air Space’ was primarily intended to guarantee the maintenance of overall balance and impartiality amid all the opportunities which Regional broadcasting offers for the free expression of opinion on the air. The programme fulfils this function satisfactorily, and in addition, listeners are seeing in it yet another platform from which the ordinary man’s views may be made known. Anyone in the Region with something to say on any matter of public interest can write to ‘Air Space’ about it. He can be sure that if his fellow listeners do not agree with him they will not be slow to say so in the next broadcast. Taken together, these broadcasts form a considerable proportion of the Region’s total effort and output. They are alert and challenging, provocative and informative. They make good listening in themselves and undoubtedly they perform a public service in a Region which has had no chance of forming any unified opinion about its own affairs since Wessex ceased to be a kingdom.